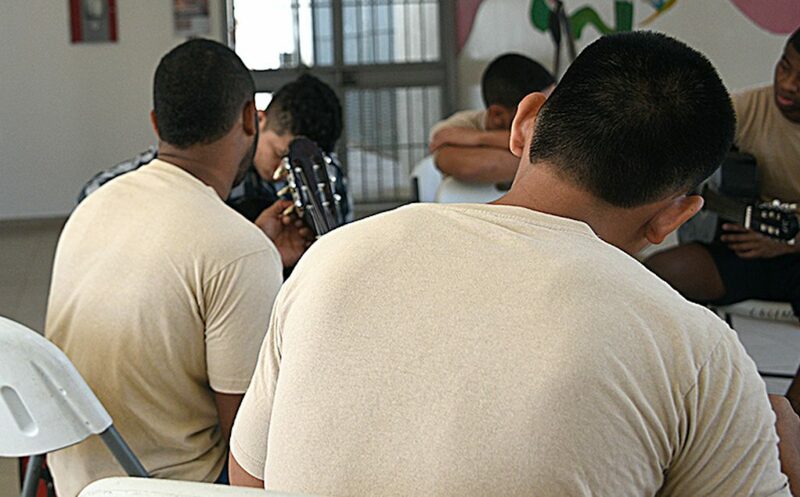 A group of young inmates of Las Garzas de Pacora juvenile detention center practice hymns on guitar to play for Pope Francis during his visit on Jan. 25. Many of the men learned guitar and to sing specifically for this event. By Panamanian law, the men’s faces and identities are to be kept confidential. PACORA, Panama — Eduardo entered the small library of Las Garzas de Pacora juvenile detention center for an interview with World Youth Day (WYD) press with sweat on his forehead, his shirt covered in paint and a small smile. He and dozens of others had been touching up the outside of the school building in preparation for Pope Francis’ visit on Jan. 25. But Eduardo hasn’t just been preparing the buildings to receive the pope — he’s been preparing his soul. The 21-year-old will be the first of 12 young men in Pacora to have his confession heard by Pope Francis. “I want to give him an overview of my life,” he said, “at least, a really fast one. Born into a devoutly Catholic family, Eduardo became involved in gang activity at a young age. He was designated as his gang’s hitman and eventually was arrested for homicide. Eduardo was transferred to Pacora from a prison in the Chiriquí region of Panama due to bad behavior and was not permitted to bring anything with him. But in November, when the center conducted a surprise inspection, they found Eduardo wearing a purple plastic rosary under his shirt that he refused to take off. So, Emma Alba, the international director of the Institute of Interdisciplinary Studies, let him keep the rosary. Starting his sentence as a maximum- security prisoner, Eduardo has responded well to Pacora’s rehabilitation and is now entrusted with minimum security. Eduardo points to July 16, 2018, as a turning point for the good in his rehabilitation. That was the day the gangs murdered his brother. Alba and Sharito Vargas, Alba’s assistant, hope that Eduardo’s encounter with the pope will be the impetus of a penetrating change that will stand the test of time. And for Eduardo, he feels this promise of change is more than hope — it’s a guarantee. “I know that this experience with the pope will be a 360-degree turn [for me],” he said. “[Because of this,] I’m now making long-term goals,” he added. The Pacora juvenile detention center (El Centro de Cumplimiento de Menores de Las Garzas de Pacora) sits northeast of Panama City and is one of six facilities of its kind in Panama. Currently housing 144 young men from 15 to 25 years of age, Pacora is not your average correctional facility; it employs a system of recuperation called Integral Intervention. According to this model, the young men are freer than a traditional prisoner would be to move around its gated, heavily guarded campus — and they do everything from repairing the plumbing to cooking the meals. Integral Intervention educates the men in mental health and communication. It also teaches them how to be a good son and a responsible father, as more than 30 percent of the men in Pacora have at least one child. Additionally, the men learn skills that boost their employability, including artisanal baking, upholstery, painting, construction, carpentry, etc. For example, 19-year-old Jorge and three other young men used skills learned in carpentry class to make a wooden crosier to present to Pope Francis as a gift. Made of wood from the Cocobolo tree, the crosier will serve as a reminder of Panama and the men at Pacora. The top of the crosier, made by craftsman Ulbaldino Batista from the Herrera province, features carvings of the WYD Panama 2019 logo on one side and a chain broken by the cross on the other, symbolizing the freedom that comes with a relationship with Christ. “It’s a privilege to have the pope here,” said Jorge. “The pope’s visit has brought union among us because lots of times each person minds his own business and no one is interested in anyone else. Alba added that, while Pacora excels in educating and preparing the men for a better life, its weakness is spiritual preparation. In Pacora, the majority of the men are evangelical Christians, and priests visit sporadically, usually on Thursdays. “So much has happened here in preparation for WYD,” said Alba. “The men have been attending regular catechesis, learning songs and asking questions about the faith. Pacora also provides each of its men with a formal education, including the opportunity to take university classes online. “We have some kids who get killed when they leave,” said Vargas. “But we also have stories that are uplifting, like . . . we have a kid who is studying to be an aviation pilot,” he added. Some have even gone on to graduate from university. “They discover in the prison all their talents,” said Vargas, “because everyone has talents.